SAHAS Nepal follows bottom-up and inclusive development approach by organizing the target communities into CBOs and later into CBNOs. The target communities get orientation, trainings and capacity building measures on socio-economic aspects, which increase their capacities and will initiate their own planning and implementation with technical backstopping from SAHAS. The CBOs make an assessment of their needs, based on which the planning process is carried out and they implement such programmes. With the increased institutional capacities, they will take lead to coordinate and collaborate with district line agencies and other development actors for community development. 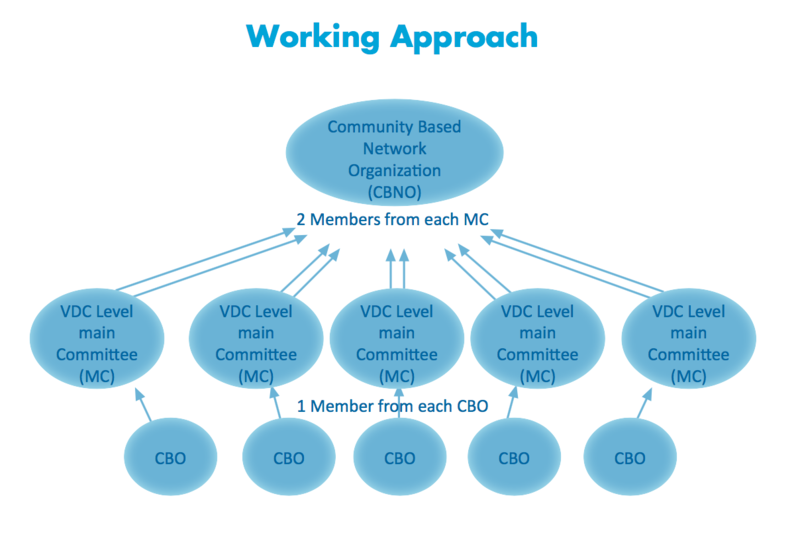 SAHAS works with the CBOs for 3 years, after which VDC level main committees are formed comprising of a member from each CBO. Main committees (MCs) serve to facilitate the CBOs in group mobilization, share action plan, monitor the progress and linkage with stakeholders. Following the formation of MCs, SAHAS Nepal work for the next 2 to 3 years leading to the formation of network organization, a member based institution, which consists of 2 members from each main committee. SAHAS Nepal put focus on the capacity development of CBNOs as these CBNOs are meant to continue the community development initiatives introduced by the organization in their areas. After 6 years of the project cycle, there will be 3 years financial and technical backstopping for the CBNOs. However, SAHAS Nepal will have long term partnership with CBNOs as its local partners through different initiatives. As of now, a total of 17 CBNOs have been formed in different working districts of the organization, who are successful in attracting community development projects from government and non-governmental organizations in Nepal as well as abroad.